Adam Ondra se na lezeckém tripu do Španělska stavil v italské oblasti Andonno (Cuneo), kde dával nadějný pokus v cestě Lapsus za 9b, kterou v roce 2015 vylezl Ital Stefano Ghisolfi. Podívejte se na video z pokusu, má cca 6 minut. Already Gullich knew that coffee and climbing goes together. Physioteraphy and Osteopathy are not bad for combination climbing either. At @klausisele, you can find it all! 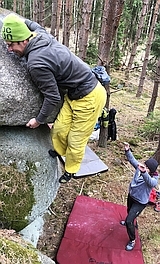 I had a visit at Klaus on Saturday, and I wanted to take advantage of fresh body in Andonno on @steghiso route Lapsus 9b. Almost sent it on my first day, on 2nd day got agonizingly close three times in a row, but had to admit defeat and swore for the return on this beast. Now on the way to Spain.